Here’s our fantasy premier league teams GW24 article where we give our early thoughts on the FFGeek team for GW24. We look back at gameweek 23, The team planning schedule, transfer thoughts plus early captain thinking. A good week when I was prepared for the worst. A 41k green arrow to 101k OR. This week I got my revenge against the template after it killing me last week and my differentials did ok. So my battle with the template couldn’t have gone much better this week. Liverpool didn’t keep a clean sheet so minimal damage there. Digne scored an own goal whereas Kolasinac got an unexpected clean sheet. Sane outscored Pogba by 4 points. As for the differentials, Foster got a clean sheet over Burnley and you know your lucks in when Morgan scores. However, the Foster clean sheet meant that Barnes blanked. Ings had a couple of chances but blanked. Hazard blanked for the 4th consecutive game and produced his 3rd set of pitiful underlying stats in the those 4 games. My template battles are Kolasinac home to Cardiff vs Digne at Huddersfield. 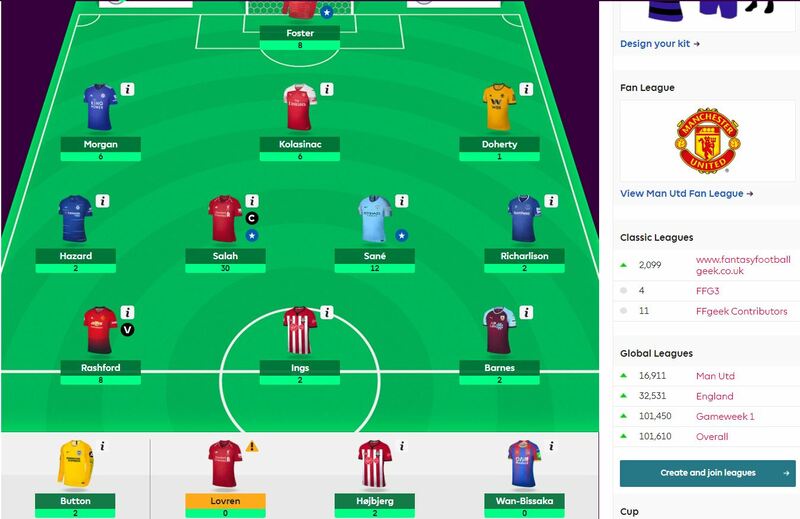 I hope Kolasinac can at least match his points. Sane at Newcastle vs Pogba home to Burnley is a trickier one although Pogba is one of my targets this week which may make that irrelevant. The differentials have mixed fixtures. Foster is at Spurs so I could actually opt for Button at Fulham. Barnes did everything but score against Watford but my preference would be to bench him vs Man Utd. 1 free transfer £5.5m in the bank. So my thoughts this week are with 4 players. Pogba, Digne, Alexander Arnold and Aubameyang. Digne has a great entry point fixture vHuddersfield and could be an option if Lovren isn’t fit or if Lovren isn’t likely to play. Digne could also be a replacement for Morgan. However his good fixture run only has 3 more in it before it gets decidedly mixed. So I feel I’ve missed the boat somewhat on him and he doesn’t feel that necessary even with the great entry fixture. I want Alexander Arnold and or Gomez (assuming Gomez is the number 2 CB pick in the side) as they are just great value even with some rotation risk. Lovren being fit and first choice if Gomez isn’t fit straight away would at least provide a stop gap. Here’s Liverpools fixtures which are just excellent. 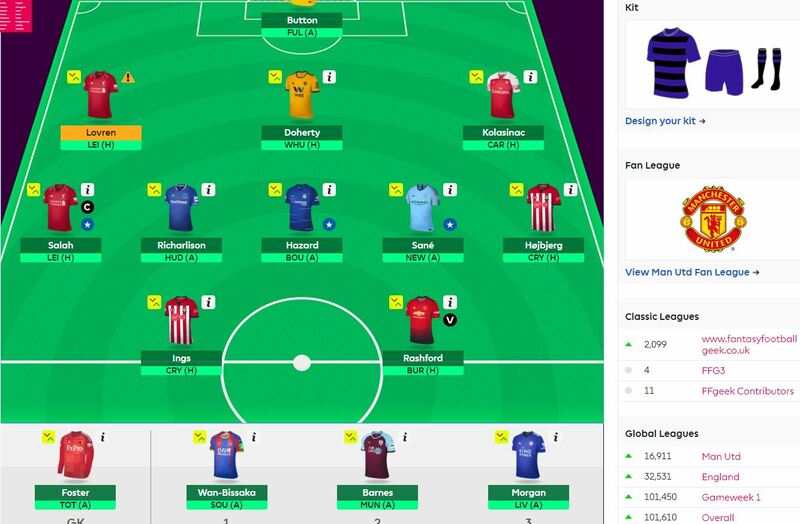 Aubameyang I would rather not buy at the moment with City in GW25. If I going to buy him GW26 looks a better option when he starts a decent, albeit short, fixture run. I could then buy Pogba this week and then get Aubameyang for Hazard with 2 transfers in GW26 if I still feel the need to get him. I think to get him this week I would need to see him as a big captain threat v Cardiff who do have a terrible record against the top 6. So plenty to mull over. If you haven’t seen my article on the blanks and doubles then here’s the link. This week and weekend are going to be very informative on the future. This week is going to be extremely informative in that we will know who the EFL finalists are that will meet Man City which will allow us to prepare for GW27. Not that much preparation should be needed. Given it will only be Everton v Man City postponed and 1 of Burnley v Spurs or Chelsea v Brighton. Most of the damage should be accommodated on our subs bench for GW27. The weekend is 4th round FA Cup which means we will know the FA Cup 5th round draw before the gameweek starts. We’ll then be able to piece together the ties left in GW31 and GW33. At that point we can hopefully make an educated guess on the quarter finalists in order to prepare for GW31. When I started the thinking I thought you had to use your free hit in GW31 but that causes you a problem with the gameweeks ahead. I thought that because I could see a situation where you had to ditch the top 6 teams in the run up as I thought they would make up a decent chunk of the quarters. Therefore you’d end up with a team of Cardiffs and Newcastles etc. 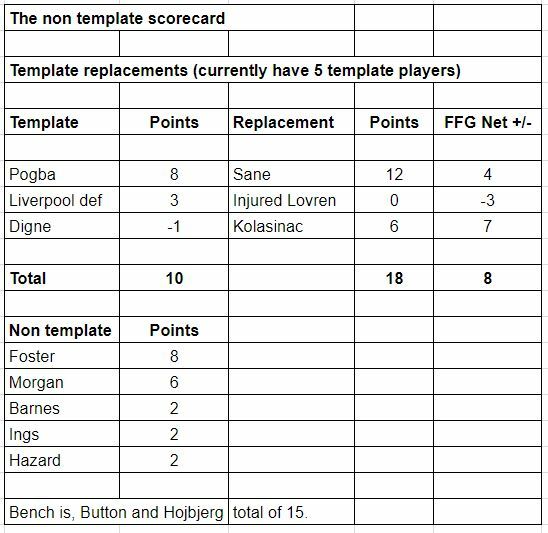 However with 4 bench positions and the fact that Liverpool have games in both blanks, seemingly guaranteed, then you can have 3 Liverpool players in GW31 plus 4 bench players of any team as the core of your FPL team. That could potentially mean only 4 non top 6 starters which seems ok. I think just preparing for GW31 is just about doable. The amount of transfers available to navigate GW31 is another issue as we won’t know the quarter finalists until after GW26 giving us a maximum of 6 transfers to use as preparation. That’s why some gamble transfers on potential 5th round winners may also be needed. Anyway these are just initial thoughts. I’m hoping the weekend will make it clearer. As I always say I’m no expert at this so any dissenting views are welcome. If I make the Hojbjerg transfer to Pogba then the decision is only between Doherty and Wan Bissaka. Even that isn’t a decision if Lovren isn’t fit. Then it picks itself and I leave Barnes on the bench. At the moment I’ve gone Button over Foster. Hard to see past a rested Salah with no FA Cup 4th round games but the poll will be interesting. Plenty to mull over indeed. My transfer for the next game week is Aubameyang. That home tie against Cardiff is just too juicy to ignore, not to mention I have a placeholder 3rd striker who I need to dump. I watched Cardiff against Newcastle and they were utterly abysmal at the back. This could be a slaughter by Arsenal. I expect a big return and will very likely captain him ( altho not captaining Salah at home to a Leicester side who were dreadful in defence against Wolves could be disastrous). I will gladly take the ride with Auba through the city game as the next 3 fixtures are great as you pointed out. He could always score against City too. Thanks a lot for the in-depth analysis Geek. Good content always. I am with Ian on Aubameyang – the Cardiff game looks tasty and he has been unlucky not to score points recently. Watching his positioning on MOTD gives me the confidence to get him in this week. I plan to keep him for the season pending a potential swap GW 29 & 30. His record against the top 6 is not so hot but he did scored 16 points against a good Spurs side recently so a worse case scenario if 2 points away to City is not a showstopper for me considering the potential route v Cardiff and subsequent fixtures. 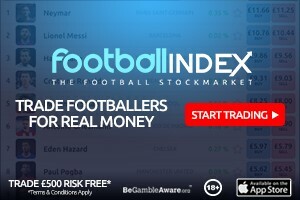 It will be interesting to see the bookies anytime scorer odds but at 32% ownership he could hurt next GW. As the 1st choice Leicester defence should be restored next GW I am considering Auba as a differential captain. However, as I am not chasing, I will likely use the shield of Salah. Ings or Wan Bissaka for week 24? As Southampton are at home I’d go with Ings. He looked sharp enough last GW. I’m curious what folks think about Higuain’s imminent Chelsea arrival? Weeks 24/25 are great fixtures, especially Huddersfield at home in 25. Maybe worth taking a flyer if he’s priced around the 8.5-9 range, if only for potential placebo effect. I think the best idea is to wait and see. Not very confident if Higuain starts scoring or not. PersonalIy, I’d wait and see. 9,5 is not a cheap price to gamble. Especially if he starts slowly.